Flanagan is the founder and executive director of Conservative Society for Action, and was the focus of a lengthy 2011 Politico profile on the Tea Party movement in New York. 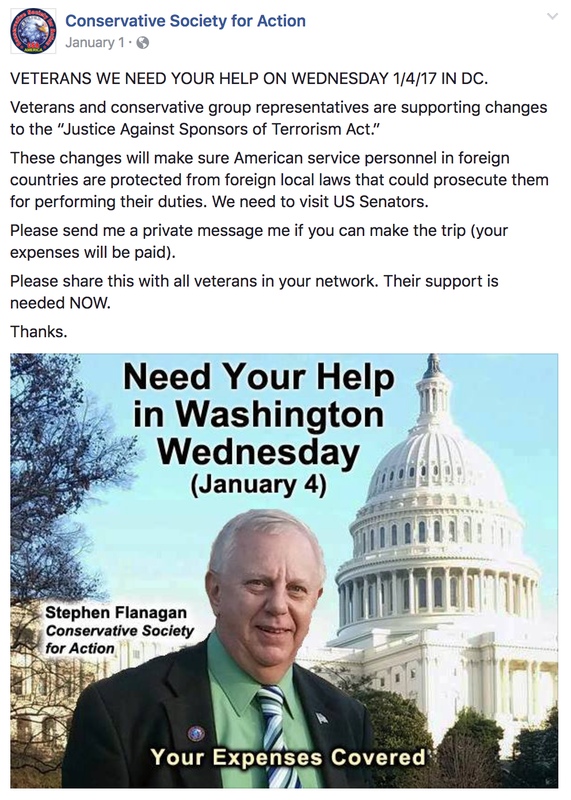 In addition to inviting veterans to accept free trips to Washington to lobby for changes to JASTA, Flanagan solicited signatories for a letter to Congress and also traveled to Capitol Hill himself. His activities appear to have been coordinated within a Saudi lobbying operation led by Scott Wheeler. As first reported by 28Pages.org, on March 31, Wheeler’s firm, Capitol Media Group, registered with the Department of Justice as an agent of Saudi Arabia and declared that the kingdom paid $90,000 for Wheeler to bring veterans to Washington to press for changes to JASTA. Saudi Arabia also reimbursed $275,000 in travel expenses for participating veterans. Flanagan says he had no idea that Wheeler, who also runs the National Republican Trust PAC, was working for the Saudis. While Flanagan has not identified that individual or responded to subsequent inquiries, his claim of ignorance is consistent with the experience of many others who have fallen prey to lobbyists cultivating grassroots opposition to JASTA without disclosing that they are doing so for Saudi Arabia. The American Conservative reported that Wheeler was working under the umbrella of Qorvis MSLGROUP. Others recruited to the cause by Wheeler and by another Qorvis agent, Jason Johns, say they weren’t told the kingdom was pulling the strings. JASTA cleared the way for 9/11 families, survivors and insurers to sue Saudi Arabia for the support allegedly provided by Saudi officials to al Qaeda and the September 11 hijackers. After JASTA was enacted in September 2016 by an override of President Obama’s veto, lobbyists for Saudi Arabia launched an aggressive campaign to convince veterans that the law posed a danger to service members and to recruit them into serving the kingdom’s interest by pushing Congress to change it. In March, a group of 9/11 families and survivors filed a complaint with the Department of Justice pointing to 10 different types of apparent criminal violations of the Foreign Agents Registration Act (FARA) by Qorvis and individuals working on the firm’s behalf. There is no indication yet of DOJ action. To garner support from veterans, Saudi lobbyists told them that, if other countries reciprocated with their own versions of JASTA, individual service members and veterans would be exposed to lawsuits abroad. However, JASTA only enables suits against governments, not individuals. The misleading argument has been embraced by many current and former government officials. The argument was also advanced by Flanagan and Conservative Society for Action in a series of four Facebook posts last year. The next day, Flanagan said he would be meeting with Senator Ted Cruz and urged followers to call their representatives on the issue. Also on that day, Flanagan appeared in a group photo taken in a congressional office and posted to Facebook by an individual who had traveled to Washington as part of Wheeler’s Saudi-funded lobbying program. 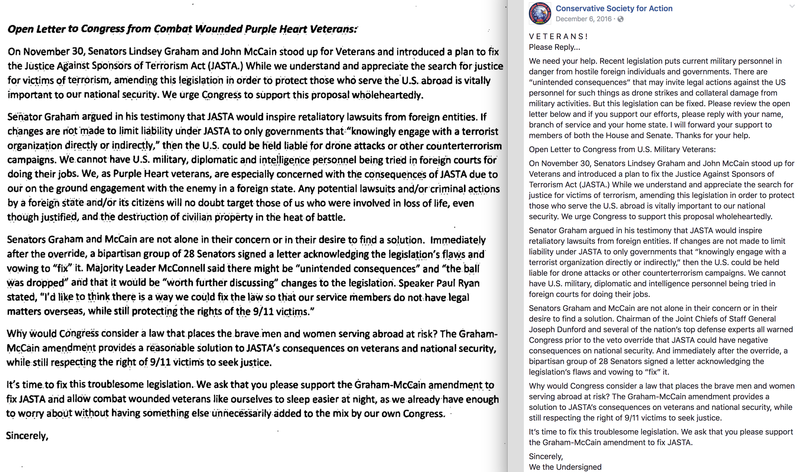 Solicitations to Sign Letter to Congress, Travel to D.C.
On Dec. 6, CSA solicited veterans to join an open letter to Congress that endorsed efforts by Saudi-friendly Senators Lindsey Graham and John McCain to alter JASTA. The language Flanagan posted is essentially identical to language found in a letter included in a Dec. 7 disclosure filing by Qorvis detailing its work for Saudi Arabia (side-by-side comparison). FARA requires that informational materials used to advance the agenda of a foreign power include a “conspicuous statement” alerting the audience to the role of the foreign government. There were no such disclosures on Flanagan’s posts. “Informational materials” is broadly defined to encompass social media. As 28Pages.org has reported extensively, offering veterans free travel to lobby against JASTA has been a cornerstone of Saudi Arabia’s campaign. Flanagan and Wheeler appear to have crossed paths as early as 2010, when Flanagan chaired former CIA officer Gary Bernsten’s unsuccessful Senate campaign. According to a campaign update, Flanagan and Bernsten had an August 2010 meeting with Wheeler in his capacity as director of the National Republican Trust PAC. National Republican Trust PAC donors who were drawn in by Wheeler’s exploitation of 9/11 might be surprised to find that he would go on to accept $90,000 from the Saudi government in exchange for helping its campaign to weaken JASTA and deny 9/11 families their day in court. Meanwhile, Flanagan’s participation in the anti-JASTA effort may be particularly troubling to those 9/11 families who—like Conservative Society for Action—call Long Island their home. According to Newsday, nearly 500 Long Islanders died in the 9/11 attacks. Many of their family members are plaintiffs in the lawsuit that seeks to prove Saudi officials abetted the murderers of their loved ones—the suit the kingdom is seeking to derail with the anti-JASTA effort that Flanagan aided, without, apparently, knowing who was behind it. One of those Long Island plaintiffs is Kathy Owens. Her husband, Peter J. Owens, was a government bond trader for Cantor Fitzgerald and worked on the 104th floor of the World Trade Center’s North Tower. If you have information about Scott Wheeler’s, Stephen Flanagan’s or anyone else’s recruitment of veterans to lobby against JASTA, please contact us: info@28pages.org.